Home > Events > Riverflies, steady, GO! Come one and all to some fascinating Riverfly training on 4th May. Booking is essential. Supported by a wide volunteer network, annual riverfly (invertebrate) surveys are a method of monitoring water quality, as well as having some fun along the way. 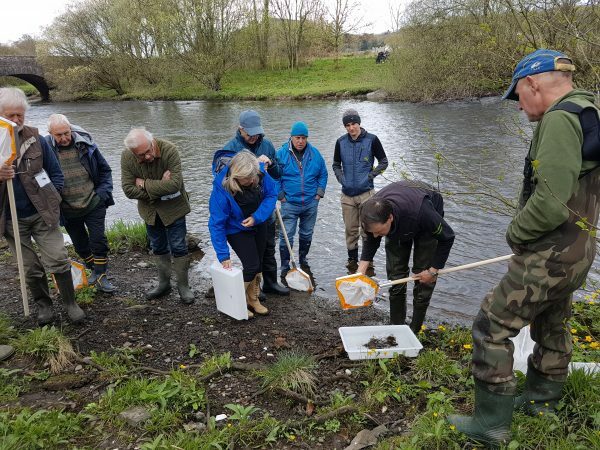 The riverfly training will provide you with the skills and techniques to identify and monitor riverfly in your local beck or river, whilst collecting some vital information about the water quality in your area. But don’t just take our word for it: Riverfly volunteer, Stephen Benn (Natural England) says,“The Riverfly training provided by South Cumbria Rivers Trust is just right! .. It is a great feeling to know that our small contribution is helping scientists to build up a Riverfly database throughout England”. South Cumbria Rivers Trust is a registered Charity (No. 1114682). Registered Office: The Refinery, The Clock Tower Business Centre, Low Wood, Haverthwaite, Ulverston, LA12 8LY.